Very few memories in life are more precious than the sight of a little boy or girl coming down the stairs to see their Christmas or Chanukah gifts waiting. The look of pure delight in their eyes as they tear through the wrapping paper is enough to ensure that parents around the world will forever continue the tradition of spending significant time and money, searching out the perfect holiday gift. Unfortunately, in an increasing number of cases, that joyful scene has turned tragic as corporate toymakers have flooded the holiday marketplace with dangerous and defective toys. A recent study conducted by the Center for Injury Research and Policy, which is located within the Nationwide Children’s Hospital, found that dangerous and defective toys result in more than 150,000 emergency room visits per year. In other words, a child is brought to the emergency room for a toy-related injury every 3.5 minutes. Ride-on toys, including self-powered and motorized scooters, hoverboards and mini-ATVs are a contributing factor in nearly sixty percent (60%) of pediatric ER visits. However, the most serious incidents are often caused by seemingly innocuous toys that appear safe but have hidden defects that can lead to suffocation, eye injuries and even strangulation. Making matters worse, the hidden nature of these defects can compound the danger by luring parents into being less diligent because they assume their children are playing with a harmless product. In advance of the holiday season, it’s more important than ever that parents (and grandparents) carefully vet the toys that they give to ensure that the holidays will be happy and safe. Fortunately, there are a number of resources available for gift-givers to easily check the safety record of the toys they want to purchase. 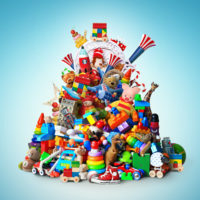 These include www.SaferProducts.gov which provides safety reports and a searchable database of recalled toys and the World Against Toys Causing Harm organization which provides an annual list of the Top 10 most dangerous toys. However, these organizations cannot catch every dangerous and defective toy that reaches the marketplace. Therefore, you should carefully check all proposed gifts to ensure they are age appropriate and that they don’t contain small or easily breakable parts, long cords that can cut off circulation or easily accessible batteries. Finally, if a child in your family does experience an injury that you attribute to a dangerous or defective toy, you should take pictures, save the toy and report the incident to the Consumer Products Safety Commission so that they can take steps to force a recall or warning to other unsuspecting parents.